An ordinary Rubik’s cube is hard enough to solve, but when you start changing up the appearance of the pieces it can get downright devious. 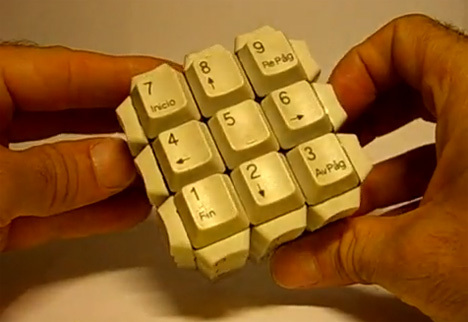 This keyboard Rubik’s cube was invented by Miguel Alonso and works much like the standard cube, but with keyboard keys replacing the colored tiles. The cube is solved when each side is configured like part of a standard keyboard. According to the creator, all that you need to make your own keyboard Rubik’s cube is an old keyboard, a standard Rubik’s cube and some glue. And, of course, the desire to make the classic puzzle even more difficult.